Ninety per cent of tinnitus sufferers have reported significantly improved symptoms after using a ‘pioneering’ treatment, according to new research. The trial of patients treated with Tinnitus Desensitisation Therapy™ (TDT) was conducted by The Tinnitus Clinic – the leading provider of the latest evidence-based tinnitus treatments in the UK – with 90% of patients reporting improvement. Of the 90%, two-thirds said their symptoms were 'much improved' or ‘very much improved’. Meanwhile those who had initially reported their symptoms to be ‘catastrophic’ dropped from more than a quarter to just 3%, while patients who ranked as ‘severe’ dropped from nearly a third to just 5% following treatment with TDT. Using the Tinnitus Handicap Inventory (THI) – a questionnaire used to help determine the degree of distress suffered by a tinnitus patient – the trial assessed patients after being treated by TDT for a period of between five and seven months. Mark Williams, Chief Audiologist at The Tinnitus Clinic, said: “While we see patients improving every day, and our trial was relatively small with 60 patients, it is always positive to see results like this supporting our work. 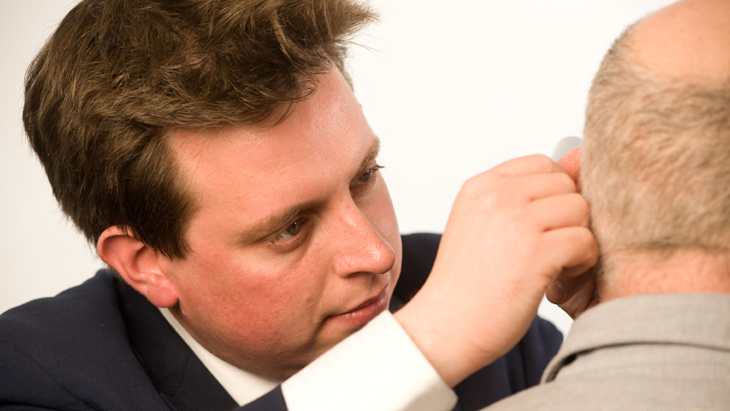 "TDT has been specially designed by The Tinnitus Clinic and is one of our most popular treatments. The therapy aims to redirect the brain’s attention away from the tinnitus signal and help the natural habituation process to occur so that, over time, patients become progressively less aware of your tinnitus symptoms. "TDT helps sufferers to take control of the impact that tinnitus is having on their lives and I’m delighted that this latest trial has produced such strong, positive results." Vithy Tharan, a Chartered Engineer in electronics from Newtown in Mid Wales has seen a marked improvement after TDT treatment at The Tinnitus Clinic helped take the severity his symptoms from the high end of ‘moderate’ to ‘slight’. The 50-year-old developed tinnitus after being caught up in shell explosions as a teenager during the Civil War in his native Sri Lanka in the 1980s. "This year I was able to go on holiday to Malaysia to celebrate my birthday and while I was there I never thought about or suffered from any symptoms," he said. "Now when I’m working, driving, watching television or on the phone, when I used to notice the unwanted noise the most, I don’t hear anything at all. "I am so glad that this treatment has come to the UK otherwise so many people would continue to suffer like I used to before TDT." Unique to The Tinnitus Clinic, TDT is a therapeutic pathway specially designed for patients who suffer with invasive tinnitus. TDT provides a bespoke range of therapies selected to meet an individual’s tinnitus acoustic profile and experience of tinnitus. Therapeutic techniques are used to control tinnitus awareness with the long-term goal of encouraging the brain to filter out the tinnitus perception from consciousness. The THI questionnaire is used by Ear, Nose and Throat physicians (otolaryngologists), audiologists and other clinicians to help determine the degree of distress suffered by a tinnitus patient. It is widely used in medical offices and in clinical trials to determine the effectiveness of a given therapy. For further information on TDT call The Tinnitus Clinic on 0800 030 6617, visit http://www.thetinnitusclinic.co.uk/help/help-with-tinnitus or e-mail info@thetinnitusclinic.co.uk.